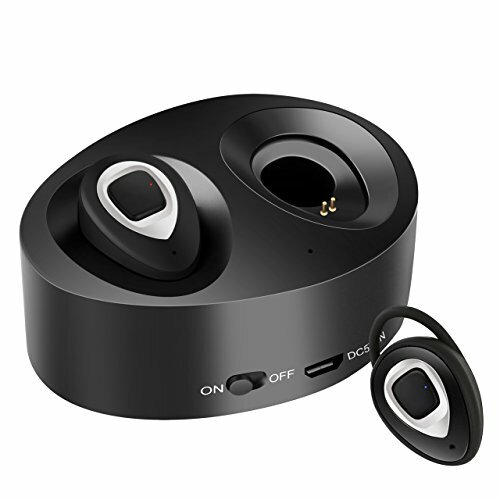 【 Bluetooth 4.1 Technology, Superb Sound Quality 】Advanced Bluetooth 4.1 technology, with 33 feet (10m) Bluetooth connection distance & built-in CVC 6.0 noise cancelling microphone, let you enjoy 360°High-Fidelity music any time. 【 True Wireless Earbuds 】 Ultra light & small design. Wireless Earbuds with Mic makes it easy for you answer any calls; Perfect for Sports, Running, Jogging, Watching TV, Listening music or Sleeping. Wear-ergonomic design with soft silicone earmuffs, No matter how long you wear, Make your phone call and music time more comfortable. 【Long Running Time】40mAh high performance rechargeable battery support 3-hour playing time to enjoy your favorite music(full charge around 1 hour); Built-in 450mAh battery charging case,it can charge your wireless earphone 3-4 times without cable. 【 Wide Compatibility 】 Work with most smartphones, tablets and other Bluetooth devices, for example, iPhone/ iPad/ Samsung/Bluetooth speaker/computer and more. 【 Professional Manufacturer, 100% Money Refund Guarantee 】 Return WF-K5 wireless earbuds back to us if you do not like it whether for any reason, purchase without any worries. If you have questions, please feel free to contact us by Email, there will be professional staff reply to you.